The parsee punch made its mark as the only illustrated comic weekly paper in the Bombay Presidency. It was published in July 1854 at the Apyakhtiar Press by Dadabhai Soheri from 12 Elphinstone Circle, Fort, Bombay. 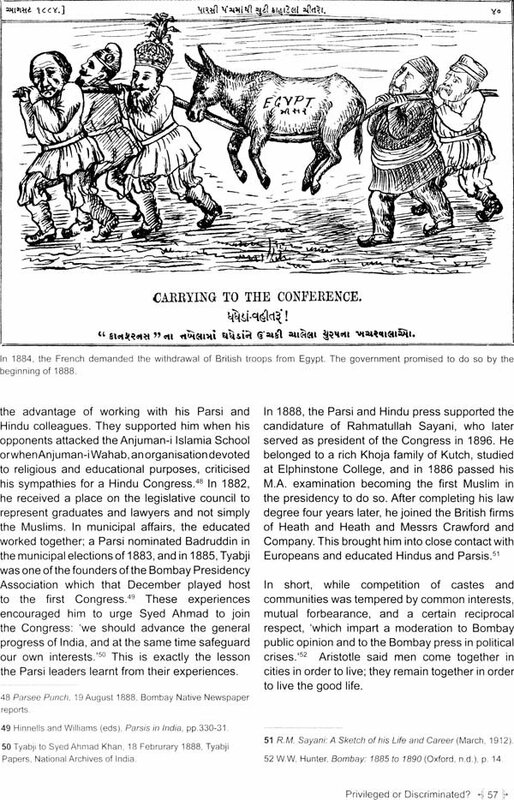 Parsee punch appeared in four sheets, demy quarto, with English and Gujarati letter-press below the illustrations. Soon, a monthly selection of the cartoon, cuts and sketches appeared as the 'Pickings' Like the London Punch, it contained 24 to 36 pages full of humorous illustrations. Four years later, it changed its name to Hindi Punch to broaden its base. It continued to be published until the 1930s. This is a Parsee enterprise, the Mahratta reported while welcoming the publication, and we have hopes that the Hindoos would follow in the wake. Parsee Punch was much more than that. If the cartoons of our every-day lives, then the Parsee Punch did just that. If on the other hand, they were meant to be skilfully designed and drawn, then the job was equally well done. The faculty of humour, observed the Indian Nation from Calcutta on 7 April 1854, is worth cultivating and we are glad to see this opportunity afforded to countrymen of sweetening their temper, enjoying the ridiculous and training themselves to look at things occasionally in their comic aspect. The Parsee Punch highlighted the relationship between public culture are colonialism. The cartoons they published illustrate, in a lighter vein, contemporary anxieties and predicaments in a witty satirical fashion. Wit and Wisdom: Pickings from the Parsee Punch presents a selection from the publication. Professor Mushirul Hasan is an internationally renowned historian, prolific author and former Vice Chancellor of Jamia Milia Islamia Unicersity, Delhi. Professor Hasan has also authored Partners in Freedom: Jamia Milia Islamia (Niyogi Books, 2006); Mutiny Memoirs (Niyogi Books, 2009); and The Avadh Punch: Wit and Humour in Colonial North India (2007) as part of the Punch series brought out by Niyogi Books.